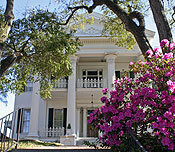 Twenty-five antebellum mansions, many of them private residences, open their doors to visitors during this five-week Pilgrimage every spring. Brilliant musical productions, theater, Gospel music, and historic presentations take the stage each evening. Entertainment includes The Historic Natchez Pageant, a magnificent musical production of dancing, historic scenes and elaborate period costumes. Songs of the South, Stephen Foster, traditional spirituals Gershwin and much more. Southern Road to Freedom, a stirring musical tribute to the African-American experience from the Colonial period to the present day. 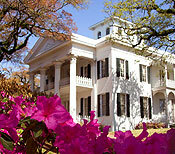 Southern Exposure, a hilarious spoof on the Natchez homes, homeowners and Pilgrimage tourists. Hostesses in period costume welcome visitors to three mansions each morning and three each afternoon, eighteen historic mansions in all. After your day's touring, relax and enjoy the town. Entertainment is available every night during the two week period of Fall Pilgrimage. Amos Polk's voices of Hope Spiritual Singers features dinner and stirring Gospel music.